Check out our full selection of wedding and engagement rings. Find elegant watches for any and all occasions. 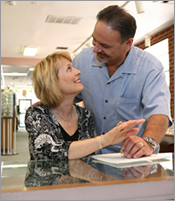 Cortez Jewelers main goal is to serve the community with quality jewelry, service, and service with integrity. Our Corona jewelry store has a vast array of items including custom designed jewelry, loose diamonds, fine jewelry, and colored gem stones. We also have a complete repair department specializing in watch and other jewelry repair.